Imagine playing a video game like Call of Duty and having the ability to lead your virtual army unit while moving freely throughout your house or other environments. Gaming could become this realistic, thanks to new technology that allows for highly accurate 3D motion tracking. 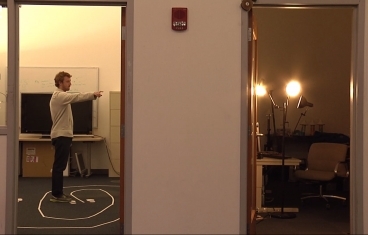 “WiTrack,” developed by Dina Katabi’s research group at the MIT Computer Science and Artificial Intelligence Lab (CSAIL), uses radio signals to track a person through walls and obstructions, pinpointing their 3D location to within 10 to 20 centimeters. “Imagine playing an interactive video game that transforms your entire home into a virtual world,” says Katabi, a professor of computer science and engineering and co-director of the MIT Center for Wireless Networks and Mobile Computing. Earlier this year, Katabi and her graduate student Fadel Adib unveiled WiVi, a system that detects humans through walls and can track the direction of their movement using WiFi signals (see “Wi-Fi signal used to track moving humans — even behind walls“). WiTrack has significantly higher accuracy and can track both two-dimensional and three-dimensional movement using specialized radio waves*, rather than WiFi signals. WiTrack operates by tracking radio signals reflected off a person’s body to pinpoint location and movement. The system uses multiple antennas: one for transmitting signals and three for receiving. The system then builds a geometric model of the user’s location by transmitting signals between the antennas and using the reflections off a person’s body to estimate the distance between the antennas and the user. WiTrack is able to locate motion with significantly increased accuracy, compared to tracking devices that rely on WiFi signals, according to Adib. “Because of the limited bandwidth, you cannot get very high location accuracy using WiFi signals,” Adib says. “WiTrack transmits a very low-power radio signal, 100 times smaller than WiFi and 1,000 times smaller than what your cell phone can transmit. In other motion-tracking systems, such as Kinect and depth-imaging camera-based systems, users must carry a wireless device or stand directly in front of the sensing device in order for the device to pick up movement. By using specialized radio signals, WiTrack frees users from wireless devices and allows them to roam spaces freely while still providing high-accuracy localization. The system’s ability to track motion through obstructions could also make it particularly useful for tracking elderly patients at high risk of falling. Current approaches to fall detection require individuals to continuously wear sensors or install cameras in the person’s home. WiTrack does not require individuals to wear sensors or install cameras, but can still detect falls with very high accuracy. The team is currently working on advancing the WiTrack system so that it can track more than one person in motion at a time. The researchers believe the system should be easily adaptable to commercial settings. “The system is not expensive or time-consuming to produce and it could be miniaturized for easier production and use,” Kabelac says. KurzweilAI asked the MIT team to explain this innovations’s uses and commercialization in a bit more detail. One of the applications we are mostly excited about is gaming. Today, to interact with a game, you have to stand in front of a gaming console; even motion sensors like the Xbox Kinect lose track of you when you are behind furniture or walls. WiTrack, on the other hand, can enable users to play games while they walk or run freely throughout the entire home: it can track them as they run down hallways or hide behind furniture from video game enemies or turn around to corner to dodge a virtual bullet. Another very important application is in elderly monitoring and fall detection. The solutions today for monitoring elderly requires installing cameras (which can make them feel uncomfortable and invade their privacy) or requiring them to wear inertial sensors (which they might forget to wear). WiTrack, on the other hand, performs these functionalities simply using radio reflections off a person’s body, without requiring them to hold or wear any device. A third application is in controlling household appliances simply by pointing at them. Say you wake up in the morning and want to pull up your blinds, or would like to go to sleep and turn off the lights from bed. All you have to do is point your hand at the home appliance for that to happen. Because WiTrack can track motion even through walls, it can allow you to control appliances even from another room. Say you leave a room and forget to turn off the lights, all you have to do is point in the direction of that room to turn the lights off. Adib: Recently, there has been a surging interest and exponential innovation in both radio-based localization, which localize a user’s wireless device, and gesture-based gaming interfaces, that can track users standing in front of them using light or infrared-based cameras. We believe that WiTrack bridges a gap between these two fields by tracking users with very high accuracy simply using radio reflections off their bodies. Our work has the highest accuracy to date in through-wall tracking for civilian use. Zach Kabelac: We expect that the technology will hit the market for certain applications earlier than others. For example, for elderly monitoring, it could make it in a couple of years, whereas it could take a bit longer for the gaming applications. It depends on the readiness of the industry to absorb these new capabilities. The researchers will present their findings during the Usenix Symposium on Networked Systems Design and Implementation in April 2014. * FMCW (frequency-modulated carrier wave) — a narrowband signal whose carrier frequency is linearly swept over a large bandwidth; differences in time are mapped to shifts in the carrier frequency. This paper introduces WiTrack, a system that tracks the 3D motion of a user from the radio signals reflected off her body. It works even if the person is occluded from the WiTrack device or in a different room. WiTrack does not require the user to carry any wireless device, yet its accuracy exceeds current RF localization systems, which require the user to hold a transceiver. Empirical measurements with a WiTrack prototype show that, on average, it localizes the center of a human body to within 10 to 13 cm in the x and y dimensions, and 21 cm in the z dimension. It also provides coarse tracking of body parts, identifying the direction of a pointing hand with a median of 11.2. 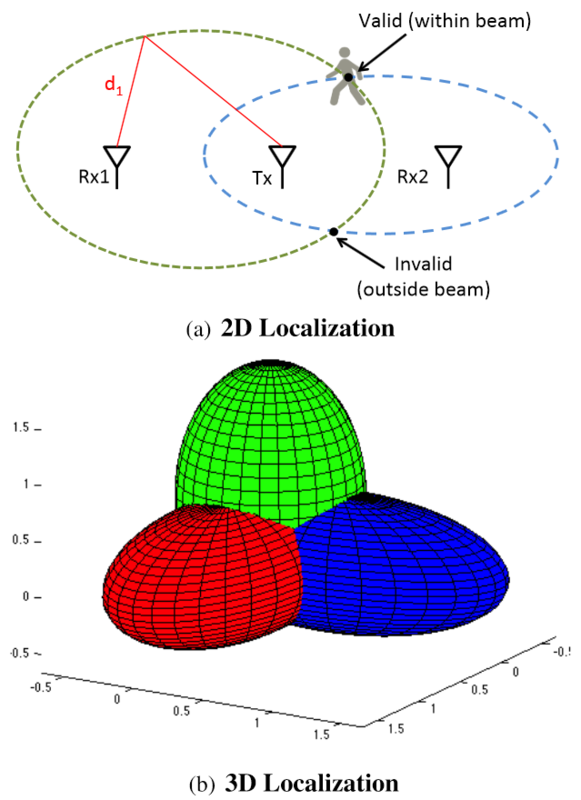 WiTrack bridges a gap between RF-based localization systems which locate a user through walls and occlusions, and human-computer interaction systems like Kinect, which can track a user without instrumenting her body, but require the user to stay within the direct line of sight of the device.